Carnegie Rupes (a huge Lobate Scarp approx. 267 Km - such as about 165,807 miles - long that cuts diagonally this entire frame) makes a dramatic sight in this large image-mosaic that was obtained by putting together several pictures taken by the NASA - MESSENGER Spacecraft early this year. This giant Lobate Scarp cuts through countless Surface Features, including Duccio Crater (a large Impact Crater - approx. 133 Km, such as about 82,593 miles in diameter - visible in the upper right (Dx) portion of the image). If you were to approach the Scarp from the South/West (lower left - Sx - side of the picture), you would find yourself facing a Rocky Wall nearly 2 Km (about 1,242 miles) high! Carnegie Rupes was so named after a Research Vessel launched in the AD 1909. The ship was built almost entirely from wood and other non-magnetic materials to allow sensitive magnetic measurements to be taken for the Carnegie Institution's Department of Terrestrial Magnetism. 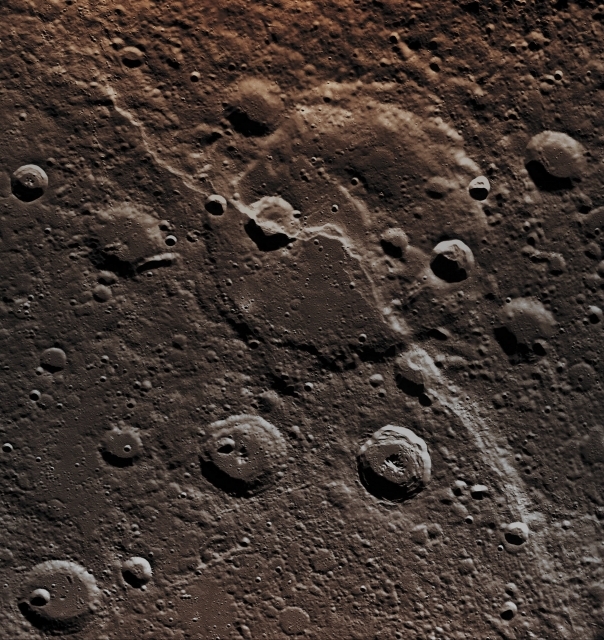 This picture (which is an Original NASA - MESSENGER Spacecraft's b/w and NON Map-Projected image-mosaic published on the NASA - Planetary Photojournal with the ID n. PIA 19279) has been additionally processed, contrast enhanced, Gamma corrected, magnified to aid the visibility of the details and then colorized in Absolute Natural Colors (such as the colors that a human eye would actually perceive if someone were onboard the NASA - MESSENGER Spacecraft and then looked outside, towards the Surface of Mercury), by using an original technique created - and, in time, dramatically improved - by the Lunar Explorer Italia Team. Different colors, as well as different shades of the same color, mean, among other things, the existence of different Elements (Minerals) present on the Surface of Mercury, each having a different Albedo (---> Reflectivity) and Chemical Composition.